Talar neck fractures = fractures in which the inferior fracture line passes anterior to the lateral process of the talus in the region of the tarsal sinus. Talar body fractures = fractures extending into or posterior to the lateral process. (Inokuchi S, Foot Ankle Int, 1996;17: 748). Talar neck fractures result from forced dorsiflexion. 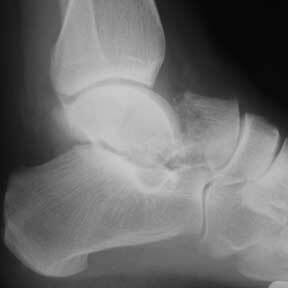 Most common fracture of the talus. Type III: displaced talar neck fracture with dislocation of tibiotalar and subtalar joints. Osteonecrosis: diagnosis made by absence of Hawkins sign (lucency deep to the subchondral surface of the talar dome on an AP radiograph of the ankle 6-8 wks after injury which denotes revascularization.) ON does not always lead to collapse. Pts should be cautioned of potential collapse and followed closely. Lindvall E, Haidukewych G, DiPasquale T, Herscovici D Jr, Sanders R. Open reduction and stable fixation of isolated, displaced talar neck and body fractures. J Bone Joint Surg Am. 2004 Oct;86-A(10):2229-34. Vallier HA, Nork SE, Barei DP, Benirschke SK, Sangeorzan BJ. Talar neck fractures: results and outcomes. J Bone Joint Surg Am. 2004 Aug;86-A(8):1616-24. Fleuriau Chateau PB, Brokaw DS, Jelen BA, Scheid DK, Weber TG. Plate fixation of talar neck fractures: preliminary review of a new technique in twenty-three patients. J Orthop Trauma. 2002 Apr;16(4):213-9.